Warm ocean temperatures have caused large expanses of coral to bleach in the pristine reefs northwest of Hawaii's main islands, scientists said Tuesday. Couch called the situation "dire," particularly for Lisianski. 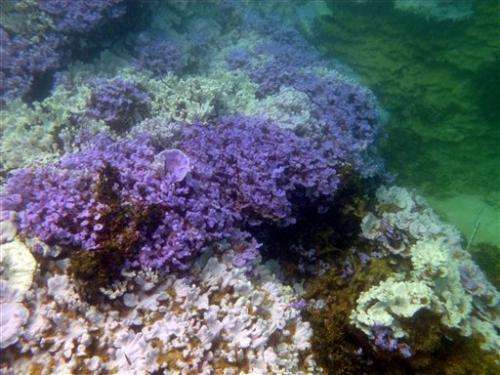 In one shallow part of the reef, 90 percent of the coral was bleached, she said. An average of 35 percent of the coral sites observed at the atoll had bleached, she said. "It's a pretty big deal. Especially after looking at the forecasts for thermal stress over the next month. It's pretty much predicted to stay at this point for the next month and then peter off at the end of October," Couch told reporters after returning from two research trips this summer. 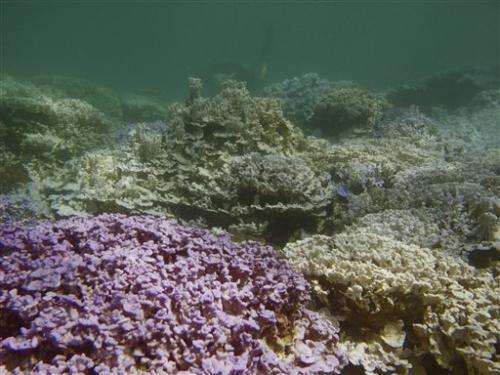 Even if corals recover after algae returns, they're still significantly weaker and more vulnerable to disease, experts say. Couch said some reefs at Lisianski were still doing well, giving her some hope. Scientists won't be able to tell what happened to the corals until researchers return next summer. This year's higher-than-normal ocean temperatures are caused by El Nino, which is a warming of the central Pacific that changes climate worldwide, Couch said. "The largest body of warm waters is literally sitting right over Lisianski right now, and it's moving northward as the summer progresses," she said. The Northwestern Hawaiian Islands last had mass-bleaching events in 2004 and 2002. This year's event is only the third mass coral bleaching event recorded in the remote, mostly uninhabited archipelago that makes up the Papahanaumokuakea Marine National Monument. Randall Kosaki, the monument's deputy superintendent and chief scientist for a 25-day research expedition that returned Tuesday, said the bleaching shows even remote waters are vulnerable to the effects of human activity. "We're working in one of the most protected marine areas on Earth. And yet we're not immune to human impacts that originate many thousands of miles away, leading to things like marine debris or in this case, global warming and climate change," he said. Coral reefs provide vital habitats for fish and other marine life. They also help protect shoreline areas during storms. Nearly 70 percent of all coral under U.S. jurisdiction lies within the Papahanaumokuakea monument.